Sun-starved residents of a remote Norwegian village unveiled an ingenious mirror system Wednesday to bring natural light to their mountain valley home and liberate them from darkness that envelops them six months a year. 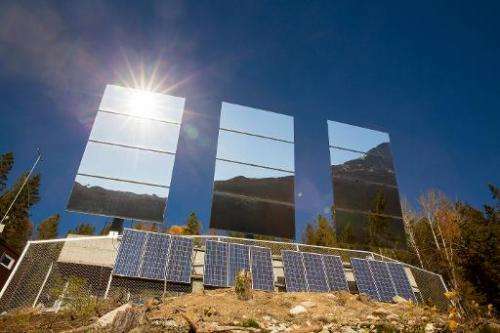 Hundreds of villagers sporting sunglasses stared at three giant mirrors which were perched on a 400-metre (1,310-foot) mountain peak, eagerly waiting for sunlight to be deflected onto their little square. It took a while, but the mirrors eventually delivered as the sun poked out from behind the clouds to deliver the first—far from dazzling—rays of early winter sunlight. The mountains surrounding Rjukan village have deprived its 3,500 inhabitants of direct sunlight for six months every year, until local artist Martin Andersen revived a century old idea to reflect it with mirrors. "From now we'll have a sun festival every day," he told AFP, referring to local celebrations which take place annually when the village finally emerges from darkness. From school children with suns painted on their faces to police officers with sunglasses normally out of season by now—— organisers said 2,500 people were there to witness the event, many parking deck chairs and parasols in sand shipped in for the day as an orchestra played "Let the Sun Shine". 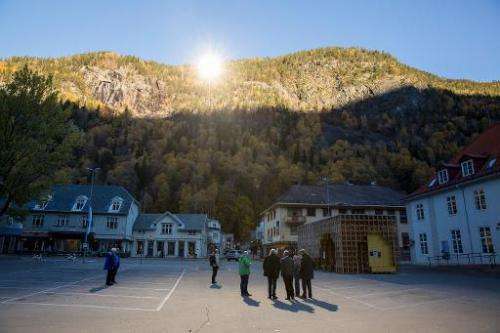 Despite strong initial reservations from some, five million kroner (615,000 euro, $849,000) was raised—80 percent from sponsors—to install the three 17-square-metre (183-square-feet) mirrors now towering over Rjukan village. A computer ensures the mirrors follow the sun and reflect the light on the market square, lighting up a 600-square-metre (6,459-square-feet) area—nearly the size of three tennis courts. "It's pretty amazing," exclaimed Bjarne Randlev, a pensioner who has lived his entire life in Rjukan. "I would never have imagined I'd see the sun here at this time of the year." Free from school for the day, Antonio Luraas Navarro said: "It feels like you're in the south with this light." "But it's a bit too cold," he added, jumping up and down to warm up. Apart from hoping to cheer up its winter-weary citizens, the locality—already known for skiing—also hopes to capitalise on the extensive media coverage of the feat to bring in even more tourists. "We're looking for both," said Steinar Bergsland, the mayor of the former industrial area. Norwegian industrialist Sam Eyde founded the corporation Norsk Hydro which gave birth to Rjukan village, the site of an enormous waterfall harnessed to provide energy for a chemical fertiliser factory. From just 300 inhabitants spread out across scattered farms in 1900, the population grew to 10,000 by 1913. At that time Eyde already had the idea of using huge mirrors to bounce sunlight into the valley but lacked the technology to do it. Instead he built a cable car, which is still in use, to allow his employees to sun themselves on a mountain top. Today the factory is gone and the population has shrunk but local residents hope the mirrors will herald a new era of prosperity. "More tourists means more business for retailers, services and hotels," said Bergsland. But he is not content to stop there, keen to remind the world that this was the site of a spectacular Second World War sabotage operation targeting a Nazi chemical plant, which could have helped build an atom bomb. The municipality believes it is long overdue for inclusion on the Unesco World Heritage List, as an example of human industrial genius. All that remains is to demonstrate that the mirrors can attract tourists during the long dark winter months. A similar system has been tried out in the small municipality of Viganella in northern Italy but a local official there said that once the initial enthusiasm died down, the tourist numbers also dwindled.